A while back, I posted a review of Tokuyama’s chairside hard reline material. I was very impressed with the material. Tokuyama thanked me by sending me a sample of their soft reline material. And, until last week, it sat in my cabinet unused. Honestly, I don’t see a lot of removable prosthetics cases. So, I had to wait for the right case to come along. The right case was a long-time patient. She’s had trouble on and off with her lower unilateral partial denture. We’ve adjusted it… and adjusted it… and adjusted it. The ridge is nearly non-existent. 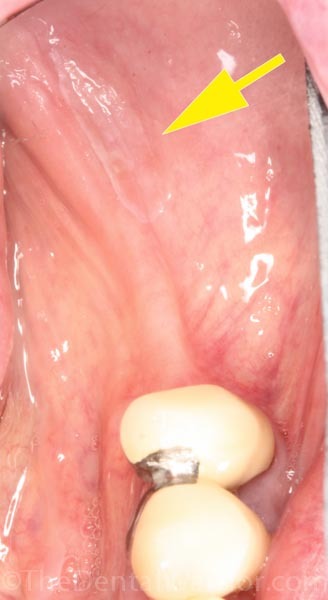 Recently, I noticed a whitish lesion in the area covered by the partial base. I sent her to an oral surgeon for evaluation and biopsy if necessary. The surgeon felt the partial needed adjustment. And, of course, the patient was complaining that it wasn’t comfortable. I didn’t think I could adjust it anymore. Then I remembered that I had this soft reline material! So, I gave it a shot. In my review of Tokuyama’s hard reline material, I mentioned that it was so easy to work with. Plus there was no smell, no exothermic reaction (heat), and no bad taste. The same is true for the Sofreliner Tough material. Easy peasy! The kit comes with everything you need. The kit comes with everything you need including the priming liquid, automix cartridge, mixing tips, and even a bur and polishing wheel for finishing the soft reline. Once you reduce the acrylic base and prime it, you simply squirt the reline material onto the area to be treated. 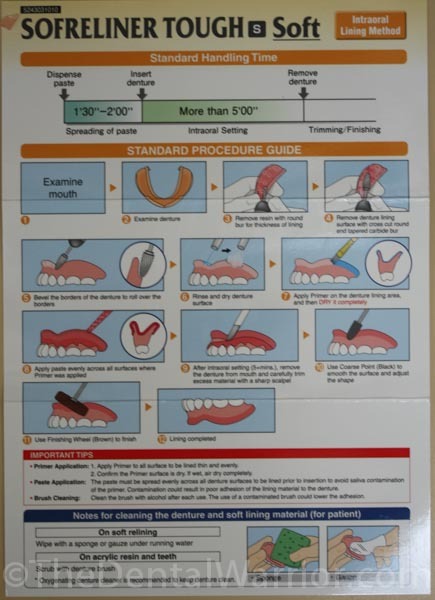 Insert it into the patient’s mouth, gently border mold, and let it set. Sorry for the shallow depth of field. I didn’t realize my camera settings were wrong. 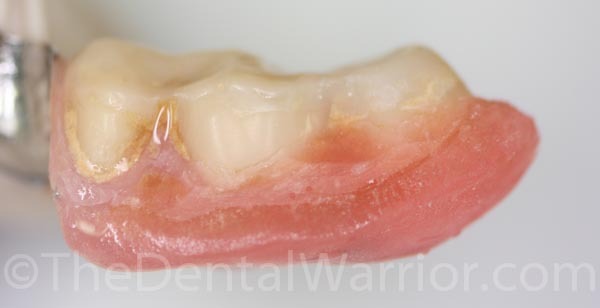 This is a photo of the material immediately after being dispensed onto the denture base. Here’s how it looks after it has set and been trimmed. I did end up touching up the small void. I had no problem adding new material. Side view of the soft reline material / acrylic interface. I played around with the relined denture to see if I could easily get it to delaminate. I couldn’t. This stuff STICKS to the acrylic. When I put it back in the patient’s mouth, she expressed an immediate appreciation for her newly found comfort! “Wow! Much better!” I thought… “yeah… let’s see how you feel in a few days.” In her case, my expectations were low, to be honest. A few days later, my office manager told me the patient called to tell us how great it felt. The patient was crying with tears of joy over the phone! THAT’S what it’s all about, folks! One of the biggest issues with relining existing dentures / partials is that the patient has to be without them for a period of time – sometimes more than a day. They don’t like that. These reline products from Tokuyama (hard / soft) eliminate that issue AND are FAR better than any other product I’ve tried in the past. 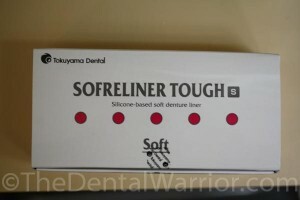 If you’re looking for an easy-to-use chairside soft reline material, I can highly recommend Tokuyama’s “Sofreliner Tough.” No impressions. No lab. Instant gratification. Happy patients! 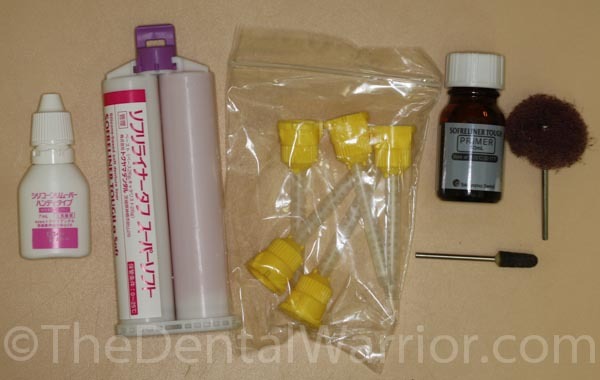 This entry was posted in Dental Product Reviews and tagged Sofreliner Tough, soft reline material, Tokuyama. Bookmark the permalink. Awesome Mike!! I will definitely have to try both of these out when my current supply of reline materials runs out. Thanks for sharing. I just read your review of the hard reline material. In this review you stated that it came in an automix cartridge but the actual review shows a powder and liquid mix. Am I missing something? OOPS! You’re right! Will correct! Thanks for the heads-up. Thank you for the article on Tokuyama Sofreliner Tough and with photos! What I liked about this was that you actually used this on a client and gave great feed back on this product and in return the client sent you a thank you card. A very Happy patient indeed! In our office we like the easy peasy! Especially when it comes to our patients. 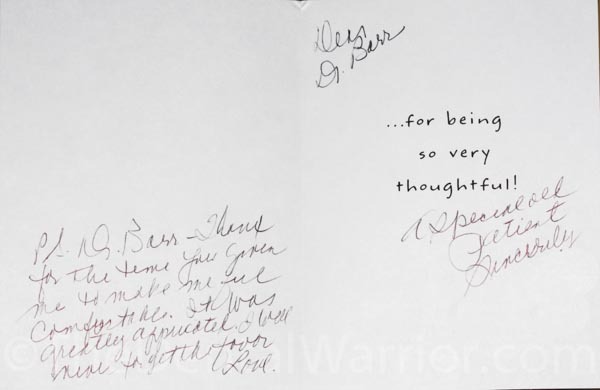 We always like it when our patients leave happy after a service. Thanks again Dr. Mike! So glad the product worked well for you and your patient.